In our shrinking world, Ebola is just a plane ride away. Dr. David Fedson’s life work has centered around such pandemic diseases as influenza, pneumonia, and, most recently, Ebola. His presentation will include the details of treatment and prevention of communicable disease and the manner in which governments and big medicine can facilitate or thwart immunization programs. He lives in a small French village with his wife, who works for the World Health Organization. As our newly-installed President Doug Johnson chimed our bell, he was doing more than marking the opening of todays’ meeting. He was demonstrating his motto “Real People, Real Impact.” The Pledge of Allegiance was led with a hand over our heart by Robert Pierce. The always engaging Vickie Hardcastle engaged us by giving thanks for the ideals, the service and the benefits of Rotary that we share with one another and the outside world. Thoughtful. Joy Parker introduced three visiting Rotarians: Dr. Angelo Capozzi, our speaker and member of the Tiburon/Belvedere Club, Donna-Lee Young Rubin, the Executive Director of Rotaplast International from the San Francisco Club #2 who exchanged Rotary banners with us, and Tony Roehrick from the Half Moon Bay Club (and former member of our Club). Tony is returning to the club as he recently returned to Santa Rosa as the new Rincon Valley Schools superintendent. 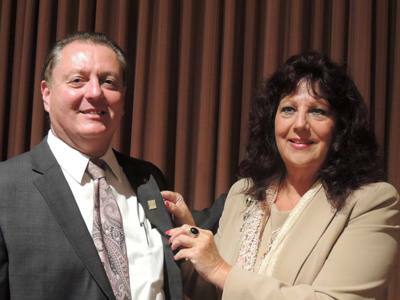 Former member and former Santa Rosa City Manager, Jeff Kolin, was introduced by Past President Jeanne Levin. Dr. Shari Shamsavari was hosted by Past President Will Haymaker. Alex Ward, son of Kerrie Chambers, was introduced by his Mom. 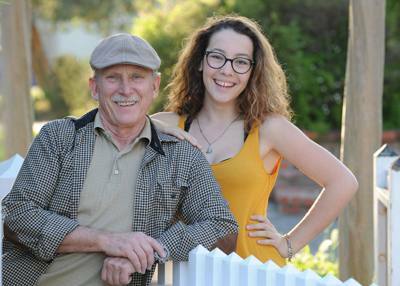 Our foreign exchange student from France, Chloe Mellier, was introduced to us by Jeff Gospe. This was Chloe’s last visit with us before her return home to a small village in the Pyrenees in the South of France. She spent her senior year of high school at Santa Rosa High. She was one of the high school graduation speakers and she gave us an excerpt from her speech. She has grown a lot while in California and spoke with emotion about her experiences here and the relationships formed. She promised to return to us someday and to continue her education at home and beyond. 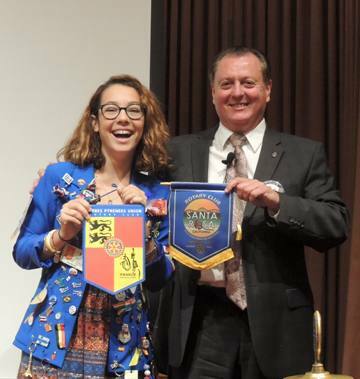 She presented a Rotary Club banner from her local Club. 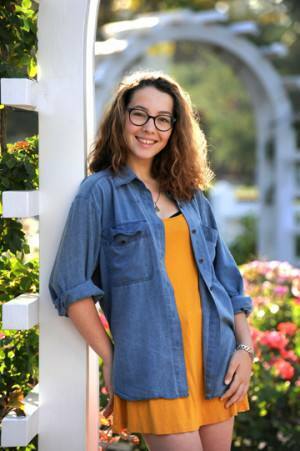 We found out that she donated $100 to The Living Room from the sale proceeds of her special French cuisine dinner she sponsored last May. We wish her well! Please see the article below for details to keep in touch with Chloe. Eileen Carlisle reports “all sunny” as far as the eye can see. President Doug drew our attention to two events, (1) the Family Summer Social at Nicole Le’s house (kids are encouraged to attend, but they are not required for attendance) on Sunday, August 30 from 11AM to 2PM. Burgers and hot dogs are provided, but BYO drinks, appetizers and desserts (but not the just desserts); (2) The Sonoma County Association of Rotary Clubs (“SCARC”) dinner meeting on July 30 at 6PM at Balletto Vineyards. RSVP to President Scott Hensey of the Rotary Club of Sebastopol Sunrise at sthensey@aol.com. Tim Delaney announced a World Community Service Committee meeting at Rick Allen’s house at 5PM on July 21 (Tuesday). Steven Dunn asks for support for the Boy Scouts of America annual auction and gala event on October 23 at the Friedman Center. Reservations are made by phone at 707-546-8137 or e-mail to staff@redwoodbsa.org. President Doug informed us that he received only positive feedback from bikers who rode in the recent Giro Bello bike ride. He read five messages and praise was received for the scenic route, use of flag markers and friendliness of the volunteers. Yeah! Let’s take a bow for the professional manner in which this event was conducted! Matt Fannin and his team were complimented for the great marking they did to prepare the ride route. Matt, in turn wanted to make sure that everyone knows he had lots of help from Rotarians and others who volunteered. “Ensuring that our cyclists enjoy the ride, are clear on the turns, and don’t end up getting lost, we decided this year to mark the course with different colored arrows. Each ride distance had its own color of arrows. The new arrow system made the ride easier for the cyclists, but was much more time consuming to set up. With volunteers from both within the club and outside the club, we spent 4-6 hours marking approximately 30-40 miles of pavement each. Some volunteers had to mark over 40 turns. Having never done it that way before, the job that was expected to take about 3 hours per person ended up taking twice as long for some. Special thanks to those who performed extra hours of duty without complaint. Their work helped to create a great experience for riders, particularly those from out of the area who were less familiar with the route. Rick Pepper, Bob Swift, Kelley Parsons, Cecil Humes, Matt Fannin, Robert Pierce, Casey D’Angelo, Craig Meltzner, Ray Giampaoli & son, Jodi Guntle and Kyle Broin. 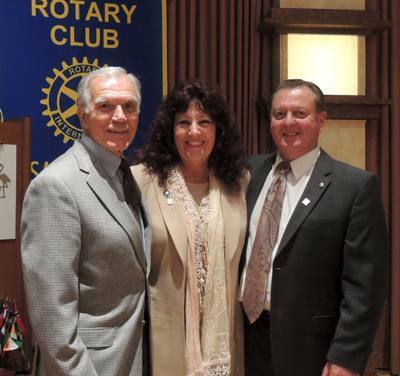 The audience rose to give a standing ovation to the Rotarian who earned the title of Rotarian of the Month for July. President Doug said this person was this years’ under-study for the director of the Giro Bello event (hint #1), is a Past President of our Club (2010-2011) (hint #2) and has been a member since 2002 (final hint). This person was Don McMillan! And, Desperado Don in his “Take It Easy” style, didn’t even have to sing and dance for this! One well-placed award, for sure. Cathy Vicini relayed a story of heroism under the face of extreme adversity. A husband and wife were attacked by a Grizzly bear in the woods. The wife pulled out her Barretta 25 caliber handgun and shot her husband in the knee. That occupied the bear while she escaped to safety. We’re not sure what the moral of that story was, but at least we think no bears were injured in the making of that story. So much for wedded bliss. Kerrie Chambers has a new puppy and a grandmother who is 102 years of age and her son turned 19 today, so she saw fit to contribute $121 to the Paul Harris Fellowship of her other son (102 + 19 = 121, got it?). Wow, somebody actually won this thing. 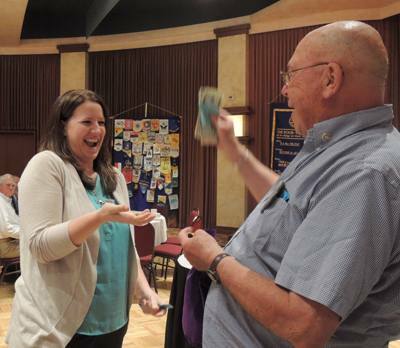 The $336 pot went to Elizabeth Karbousky through the fingertips of Past President Rich de Lambert. Elizabeth donated $50 toward her Paul Harris Fellowship. Jackie McMillan gave a great introduction for Dr. Angelo Capozzi, the co-founder of Rotaplast International, as he spoke of how this Rotary-born organization has helped 17,000 children and adults in 26 countries in Africa, Asia and Latin America get corrective surgery for cleft lips and palates. Rotaplast teams of volunteer medical/dental professionals and non-professional support volunteers have been treating patients for 22 years and it conducts about 10 missions per year on average (15 for 2015). Each mission is about two weeks in duration, and there is time allowed for fellowship with local Rotarians and some sightseeing. Cleft lips and palates are caused by environmental factors about 10% of the time and 25% are due to genetic connections. A combination of genetic and environmental causes about 65% of these cases. Rotaplast works to educate local populations about the environmental factors. They also conduct genetic research to find ways of alleviating this condition. When Dr. Capozzi went on his first mission for Rotaplast, the intent was that it would be an opportunity for Rotarians to work in a World Community Service project. Little did he know that it would expand to today’s level of activity. Each mission is scheduled to serve about 100 patients. If there is a shortage of cleft lip/palate patients, the team will perform surgery on burn victims. He showed numerous slides of ‘before and after’ pictures and the results were amazing. He could almost not describe the emotions that the patients and their families have after the surgery. The level of gratitude is off the charts. Rotaplast is a free-standing tax-qualified charitable organization, independent of Rotary but still working closely with Rotary Clubs and Rotarians in all parts of the world. Donations are cheerfully accepted for this worthwhile pursuit. They can be made by check payable to Rotaplast International, 3317 26th St., San Francisco, CA 94110 or by credit card by phone to 415-252-1111 or visit them online at www.rotaplast.org and click on the “Donate” button. 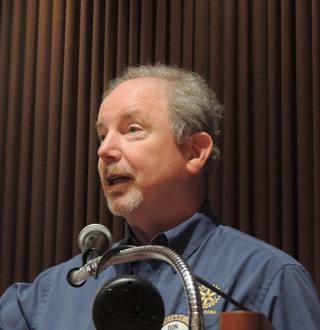 President Doug thanked a boatload of Rotarian volunteers for this weeks’ meeting. The ship mates were: Karen Ball and Fred Levin as ticket sellers, Yale Abrams as official greeter, Steve Baime as the ticket taker, Rich de Lambert and Kathleen Archer as raffle ticket sellers, Eileen Carlisle as the Sunshine reporter and Kris Anderson as photographer and Joy Parker as visiting Rotarian agent.